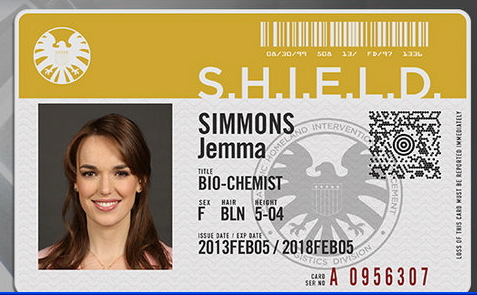 New clip from Episode 3 SIMMONS IS HYDRA! Jemma is brilliant biochemist who chose to work in field rather than in a lab. She joins Coulson's team along with her equally brilliant friend engineer Leo Fitz. Much of the equipment used by the team comes from Simmons and Fitz. The two are sometimes referred to as Fitzsimmons. Fitz clearly has feelings for Jemma and at times shows signs of jealousy when men like Ward and Antoinne Triplett entered the picture. Fitz does not articulate his feelings to Jemma directly though, until the very end of the season. At one point she is infected with a Chitauri alien virus. During this event she jumps out of the plane to save the team. She is however saved in flight by Ward who jumps from the plane with serum and a parachute. To Fitz's dismay the Agent Specialist Antoinne Triplett began to show interest in Simmons. It is not clear if they are only friends or if they feel something more. At the end of the season Fitz and Simmons are trapped in a cell under the ocean. The two brilliant minds hatch a plan to make it to the surface but requires one of them to travel to the surface without oxygen. Fitz sacrifices himself to get Simmons to the surface. Fitz survives but it is unclear what the effects of lacking oxygen will have on him.